I thought I'd talk a little bit about both running and eating today, since I post so many pictures of post-run treats here. I wanted to give you more of an insight into my reality when it comes to this...oh, and I added in an additional category - exercising, which to me is different from running. Don't ask me why, that's just how my mind works. Saturday's run was challenging for a few reasons. First, the weather - it was 70 damn degrees, with 100% humidity, so yes, we ran in hot fog. Then, about a mile into the run, I felt a small pebble in my shoe. It kept moving around under my heel and I was hoping it would work its way to the side, but I finally had to stop, remove my shoe, and shake out the debris. Luckily Cary and Diane were understanding and waited with me while I dealt with that. The last thing that made the run challenging was that I switched up our intervals, changing from 1:30/45 to 2:00/30, so we were running longer, walking less, all in that yucky weather. It's not that it was really hard, but the weather, combined with covering 5 miles, made me question that change at a couple of points during the run. I wanted to try this - lengthening the running intervals during the longer runs - to go in conjunction with running a mile without stopping during my shorter runs. As usual, we had a good time together on our long run, and we even were able to throw a little recon in on our route; Cary had a cocktail party to attend that evening, so we ran by the house where it was to be held, just to see where she'd be going. I'm always up for a little running adventure! Jeff, Diane, and I ran on Monday morning, once again hedging our bets against the rainy forecast for Tuesday. We ran a mile doing the new 2:00/30 intervals, and then ran the second mile straight through. While we didn't have hot fog like we did on Saturday, we did have cool, misty fog, which meant the roads were wet, so we ran carefully, trying to avoid stepping in puddles, along with not slipping and sliding all over the place. I miss dry days. I'm encouraged with how decent running a mile without stopping feels, so we may try to run half a mile with intervals on Thursday (which gives us a nice little warm up) and then doing the next 1.5 miles without stopping. I'm not ready to run a 5K straight through just yet (we have one this Saturday), but hey - I might get to run half of it without intervals, and I'll keep working toward this goal as we have a couple more 5Ks on tap this spring. After a long hiatus, Diane and I are finally back on schedule with going to Planet Fitness! We did the 30-minute circuit room yesterday, and then ventured into the 12-minute ab room, where we used two of the machines there. The first one didn't do much for me, but once I finished and really looked at it, I realized that I needed to change the settings to make my knees bend more - a tall person must have been on it before me. The other machine was a crunch-type thing, and I felt every movement, so that was good. We watched two people use a third machine, and saw how it didn't work properly for the shorter person until she adjusted the height settings, so that was a good tutorial, and we have it on our list to test out tomorrow, when we return to PF. After not using the muscles for these machines in several months, I was pleasantly surprised to not be super sore...but then, I didn't exactly kill it on the weights, either. Well, now I know I can push it a little more - but hey, I still wanted to be able to pack and lift boxes the day after the workout! 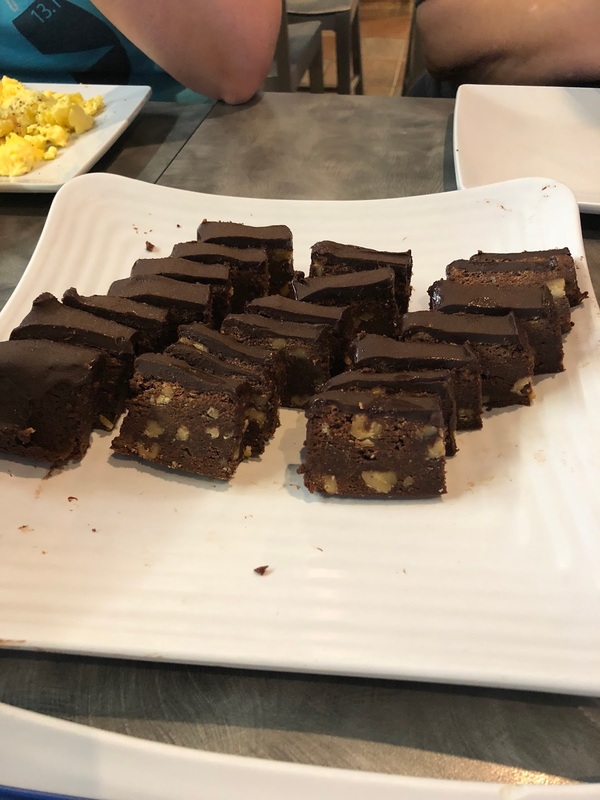 He also handed over a plate of brownie edges, yum! I usually get a toasted ciabatta roll with butter and jam on the side, plus black coffee for my post-run breakfast. I also order some sort of sweet pastry to split with Jeff - either a cinnamon twist or a cinnamon roll, lately. Truthfully, I'm just not that hungry after running and am usually full after the ciabatta roll, but the sugar addict in me has to have some of the pastry. We are there for at least two hours, so I spread out my eating over that time. 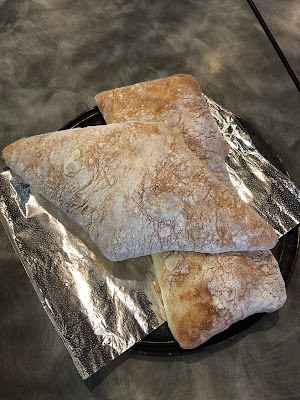 I never have any of the extra ciabatta bread - I just don't want it - and I might have one or two pieces of the brownie edges if we're there long enough. I don't eat again until late in the afternoon, when we have "linner" - lunch/dinner combined. Sometimes we go out for Mexican food, sometimes we go split a burger, but on this Saturday we went out for a huge Greek salad, which just sounded good to me. We had some hummus and pita bread as an appetizer and it hit the spot. The following day, I was back to my normal Greek yogurt/fruit/granola breakfast, and then we had healthy-ish Chinese for dinner - Jeff had the steamed veggies with chicken and I ate some of the broccoli that came with that; I ordered spicy curry chicken, which came with snow peas, onion, and carrots, and we both had some steamed rice. I ate about half of my meal, stopping when I was full. I was texting with my friend Helen about eating and the diet mentality, and mentioned to her how I don't eat the extra ciabatta - not because I'm trying to not have the calories, but because I'm just not hungry for it at that point, and she said "If you allow yourself to have anything, you don't want everything" - and you know what, that's exactly it. I could have it, but I don't want it. I know that I can go pick up a loaf of ciabatta to have with a meal at home...in fact, I have done just that on soup nights. I get to eat pretty much whatever I want, if I really want it. I have some meals where I do indulge, for sure. But I also roll right along to my next meal, and most of the time, I go right back to my old standbys - and somehow, this plus running plus exercise keeps me in the same size clothes without having to stress over calories or a weigh in. Glad I'm not the only one who thinks that way regarding running and other workouts! So funny to me that you and I eat the same on Saturdays. I always eat whatever after my run and don't eat again until we have our big meal of the day whenever that is. There was a time I wouldn't have done that though. Back when I "dieted" and controlled everything you can bet I would have made sure to eat every single calorie allowed. But I never would have eaten anything fun like ciabatta or cinnamon rolls or brownie edges, because - not allowed! I like the eat whatever you want but only eat if you're hungry way so much better and I'd venture to say I eat just as healthy as I did before. I also categorize running away from other types of exercise. It's special. Did you know you can set your Garmin intervals for distance instead of minutes? Might want to try that. You know, sometimes when I work out I'm not sore the next day but I am on the second day. Wonder if that will happen to you?! Ok, you had me at brownie edges...YUM! I must visit this bakery next time I'm in the area! Yay for Planet Fitness and having a workout buddy! That always makes things much more fun! You definitely need to swing by Blue Baker next time you're here! That's one of the reasons I like weight watchers - when Tony wanted me to do low carb with him, the second pasta was off the table, that's all I wanted! I do love the splitting dinners instead of each of you getting one. I always ask for a to go box at the beginning of the meal and put half in and put it aside before I even eat. I'm really glad Jeff likes to split meals with me - it's cheaper, too! At least you're realizing that it's food/drink that's affecting you, although it's sad when you realize it's something you enjoy! YES YES YES!!!! Love your attitude about letting yourself eat what you want. I cut back on my portion sizes and have been losing weight that way (and I needed to, in all honesty) but like you, nothing is really off-limits. If I want to eat something, I do; I just don't go crazy with it. I've been going to PF to do a lot of my runs this winter and am definitely intrigued by the 30 minute workout (I have a good view of it from the treadmills). I remembered you saying you had done it before. I'm done with group fitness classes for a while after today, so that would be a good supplement! That is such a smart statement from Helen, and such a great thing to keep in mind. I used to be so afraid of being hungry (not like it was an issue before, just not wanting to be uncomfortable), that I never was - so I never really enjoyed/wanted anything, cause I always had everything. Now I get hungry and want things and enjoy them so much more! I am glad you have a system that works for you. And when I see you posting about treats, I actually assumed you "balance" (hate the word for this, but it works) it out like this. I tend to only post treats on my social media and wonder if people think that is how I eat. Is it usually this rainy this time of year? Blah! I hope you have some drier runs soon. It sounds like you are kicking a$$ with running a full mile and I am excited you are going to go for 1.5! Hope you have a great 5K this weekend! Kudos for restarting the planet fitness routine! I’m trying to get into that same mentality with eating....allowing myself to have what I want so it doesn’t become some big huge ‘issue’ that I lust and dream over!!! Interesting...I didn't realize it, but I haven't lusted or dreamed over any kind of food for a long time. Maybe that's why, knowing I can have whatever I want whenever I want? Hmmm. I am that way with food most times, but I definitely still have my red light foods, which I overeat every.single.time (Reeses PB cups), and having them around just isn't a good idea. Yay on the lifting! It's always good to get back into an old routine again. Yep, I have those foods (mostly candy) that I don't keep in the house for that reason. WE've been in our house almost 19 years. Wish you could stop by and help me purge. My hubby is a hoarder. uGH! !